Rice has been the principal/main food of Vietnamese since the creation of the first state of Vietnam or Văn Lang State in 2,000 BCE or more than 4,000 years ago. Through the popular story Bánh Chưng and Bánh Dày we know that during his reign, King Hùng VI selected Lang Liêu Prince as heir to the throne. The King also to his citizen to prepare these two cakes to honor their parents and ancestors. Rice production activities created jobs and employments for a large number of Vietnamese and therefore rice cultivation activities have generated money and wealth for the population to pay for expenses in life. In the past, the ploughing of rice fields, rice seedling pulling, transplanting, weeding, harvesting, threshing and drying rice need substantial labor force and therefore create opportunities for young men to meet young ladies and from meetings while cultivating rice, young men and ladies had become husband and wife and create new lives. The following pages introduce the different roles of rice in the daily life of Vietnamese. In addition to hunted animals and other plant organs, prehistoric people in Vietnam gathered the grains of wild rice plants for consumption to keep them from hunger, especially during drought periods and consequently they domesticated and cultivated rice for food. Rice plants produce rough rice grains or hạt lúa. After milling and cleaning rough rice grain become milled rice grain or hạt gạo, which is the staple food of Vietnamese. With time gradually rice had increasingly become more and more dominant in Vietnamese food baskets and Vietnamese today usually greet each other “ăn cơm chưa?” or “Have you eaten rice yet?” when they meet each other. Boiled/steamed milled rice is cơm, which is Vietnamese popular rice dish and for Vietnamese, the verb “to eat” is often the same as the verb “to eat rice” or “ăn cơm”. In general, rice is the staple food of Vietnamese as it is the main provider of energy and protein for life. In the recent past, data from the national survey on living condition of the people in 1992-1993 show that rice was the staple food of 99% of Vietnamese families and the food calories from rice provided ¾ of the food energy to the Vietnamese (GSO, 1995). In 2002, on the average, a Vietnamese consumed 169 kg milled rice/year, which was the second highest in the world, after only that, which was consumed by a person in Myanmar (Table 2). The rice consumed in 2002 provided 1662.50 calories and 33.9 grams protein/person/day. “Two rice meals a day. That is my happiness”. Lack of food pulls poor people down and denies them the opportunity to develop. Therefore, having something to eat is sometime too important for poor people. It is sometime more important than having gold. The folksong “Thằng Bờm” was very popular in Thừa Thiên-Huế during the 1950s; it tells how a “hungry and stupid guy” valued xôi or steamed/boiled glutinous rice. The rich man proposed, How about nine chains of “ca me” (a sea fish)? For thousand of years, rice production is the main agricultural activities of Vietnamese. Rice production has occupied a great part of agricultural land. Therefore, through the 4,000 year of their history, Vietnamese always prayed for good weather for rice plants to favorably develop. When the weather is good, Vietnamese in all villages would exert their maximum effort in rice production in order to create wealth for their families and villages as it is described in the following ca dao. A good rice season produces good rice harvest and thus provides food and wealth and money to families of farmers to pay tax. A good harvest also provide materials for raising chickens, pigs as well as for producing fertilizer for next rice crop. When the weather is not favorable, rice plants develop poorly and low yield leading to many difficulties for farmers and their families and many rice farmers go to debt. Lấy chi đăng nạp nữa mà? Lấy chi công việc nước nhà cho đang? What could I use to pay tax and duty? What could I use to pay for other expenses? In Vietnam, marrying is building family and building society. Rice production activities create suitable conditions for girls and boys, men and women to meet and consequently to marriage. In villages in the past, people gave importance to rice production activities. To be able to produce a good rice crop is to obtain a respect of families, neighbors and society. Therefore, young ladies and young men at about marrying age always tried their best in rice production activities so that their rice crop is healthily green and producing many panicles. The following ca dao describes the wish of young lady who tries to perform well in rice production in order to convince the young man whom she wants to marry. Why do you scoop the beautiful moon and throw it away? In recent times, most of rice milling operations in the region is done with milling machines. But in the old day, Vietnamese used pestles and mortars to produce brown rice and milled rice from rough rice. The process was called giã gạo, which turned rough rice (or lúa) to milled rice (or gạo). This job was generally done by ladies of farmers’ household who usually sing songs (or hò, hát) while performing the tasks. The singing during the pilling of rough rice spread all over Vietnamese villages in the old times. Young ladies usually invited young men to join them in the task and this created lively situation and lovely scenes in villages. Musician Hoàng Thi Thơ wrote the following lines. Come on, come in, my dear! Đến đây chẳng những ngồi không? Do you know; how many plants are there in a rice field? How many turns does a river have, how many folds would cloud have? After exchanging songs and knowing better, young men became more daring and proposed the following to young ladies. Không biết em có liệu được chăng ? Biết chăng cha mẹ vừa lòng hay không? Let me know, please, would your parents accept? After two years of làm rễ and was approved by the family of the young lady, the young man prepare the following gifts for the wedding. After marriage, husband and wife joined force to build up the family. Rice production activities required the contribution of every members of the family. Husband and wife encouraged each other in their effort on rice production and this was expressed in the following ca dao. In general, a farmer has small rice land, but in some cases, the farmers’ small rice land may include several small pieces of land at different location which may be at different elevations. When there was no irrigation facility as in the past, the land in low elevation (đồng sâu) has water earlier than the land in higher elevation area (đồng cạn) and farmer would do land preparation in dong sau and when there was rain to bring water to the land in dong can his wife would do rice transplanting in dong sau and he would do land preparation on dong can. Drought damage rice crops. During drought periods, farmers would feel the pain and husband and wife cooperate in watering/irrigating their rice crop, as expressed in the following popular poem. The panicles are choking under the evening sun, dear! Vietnamese value rice grains greatly. 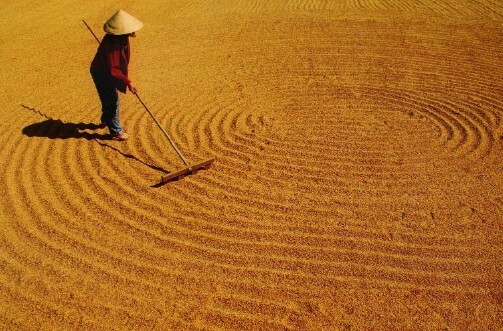 For them a rice grain, is a gold grain or “hạt gạo, là hạt vàng”. In the past, Vietnamese gave highest respect to scholars and second respect to rice farmers. However, when rice is scarce, Vietnamese gave highest respect to rice farmers and second respect to scholars. Similarly, the minor ethnic group in Tuyên Quang Province, Sán Chay people has a proverb which says “Rice is the most precious, the grain feeds human. Literature is the second most precious, it teaches human knowledge for safe purpose”. Vietnam has favorable conditions to produce adequate rice for feeding its population and for export. However, when rice crops failed due to a combination of poor policy or bad weather, people suffer from hunger and famine. The bad policies of occupying French and Japanese Armies and the failure of rice crops during the World War II had caused a widespread famine in northern half of the country that killed more than half of million people died between 1945 and 1946 (Vien, 1993). Therefore, Vietnamese evaluated their kings and rulers based on their policy to support rice production for adequate food security. Vietnamese considers a rice grain is a grain of gold. This is because of not only rice is food but also because of the fact that it is difficult to produce rice. Vietnamese therefore highly appreciate and thank full to rice farmers. Should remember, each of the tasty grain contains hundreds of pains and hardships. Both non-glutinous and glutinous rice crops have been cultivated in Vietnam for several thousands of years. The ripen rice grains or rough rice grains are called luá or thóc in Vietnamese. The first milling step of rough rice is de-hulling. From 100 kg of rough rice, de-hulling process produces normally about 80 kg of brown rice and 20 kg of hulls and husks. Brown rice is edible, while hulls and husks are inedible. However, brown rice usually has poor shelf life, long cooking times, and rougher texture when cooked. 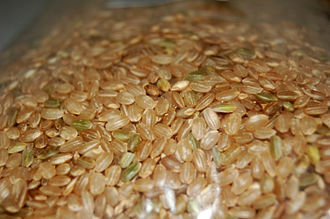 Therefore, today, most of brown rice is subjected to further milling to produce milled rice, and broken rice, and bran. 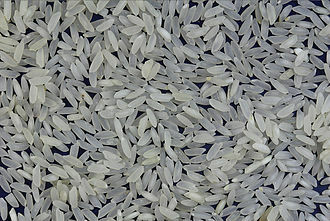 In Vietnamese, brown rice is called gạo lức, while milled rice or white rice is called gạo trắng. Similarly brown glutinous rice is called nếp lức, while milled glutinous rice is called nếp trắng. Milled rice or gạo is washed then boiled/steamed to cook with water in a cooking pot. During cooking, the milled rice absorbs the water, increasing in volume and mass. The rice is considered cooked when it has absorbed all the water and the dish is cơm in Vietnamese. Vietnamese usually greet each others ăn cơm chua? or have you eaten? when they first meet in the day. At their home, inviting relatives and eat, the lady of the house would say ăn cơm or let us eat. Plain rice is served daily for lunch and dinner with just a few protein (meat or fish) and vegetable dishes as side dishes. Cooked rice or cơm is sometimes fried to make fried rice or cơm rang/cơm chiên. Milled rice is also used to prepare rice porridge/congee or cháo. There are a large number of dishes of cơm rang and cháo and the names of the dishes vary with the added ingredients used in their preparation. For example cháo gà is chicken rice porridge and cơm rang trứng is fried rice with egg. 3. Bánh Chưng: Bánh chưng is a traditional and popular rice cake in North Vietnam. Milled glutinous rice with filling of mung bean, pork and other ingredients are wrapped in dong (Maranta leuconeura ) leaves into a square shape and boiled to cook. It is an essential element of the family altar on the occasion of Tết or Vietnamese New Year in Northern Vietnam. 4. Bánh Tét: Bánh tét is a traditional and popular rice cake in South Vietnam. Milled glutinous rice with filling of mung bean, pork and other ingredients are wrapped in banana leaves into a long-cylindrical shape and boiled to cook. It is an essential element of the family altar on the occasion of Tết or Vietnamese New Year in Southern Vietnam. 4. Phở: Phở is a dish of flat rice noodle, which is popular throughout the country, perhaps as popular as cơm. It is also widely appreciated worldwide. Vietnamese eat phở at anytime during the day long, as breakfast, lunch, dinner or snack. There are two types of phở: phở bò or beef noodle soup and phở gà or chicken noodle soup. In both dishes, steamed/boiled bánh phở are served in a bowl with a broth and choice meat. The broth of phở bò is generally made by simmering beef bones, oxtails, flank steak, charred onion, charred ginger and spices such as cinnamon, star anise, black cardamom, coriander seed, fennel seed, clove, salt and black pepper seed. On the other hand, the broth of phở gà is made by simmering chicken bones, onion, ginger and spices such as star anise, coriander seed, fennel seed, clove, salt and black pepper. The choice meat of phở bò are slices of beef tenderloin, while that of phở gà are choiced pieces of chiken meat.Both phở are consumed with ingredients such as green onions, basil, fresh chili pepper, lemon, mungbean sprouts, coriander leaves, and ngo gai or saw tooth herb. Additionally fish sauce, hoisin sauce and chili sauce may be added to taste as accompaniments. 6. Spring Roll: Spring roll is a traditional and popular dish of Vietnamese. It is made of rice wrapper or bánh tráng rolled with stuffing of ground pork and fried in oil. The spring rolls are served with sauce, which is a mixture of fish sauce, lemon, garlic, onion, and sugar.